My job requires me to be out of bed before rooster crows. Half past 3 in the morning to be precised.My body clock has well adjusted to my daily routine. Even on my day off when I should have sneaky lie-ins, I still wake up fast and do a lot of chores to maximize the use of daylight. I was up early on Saturday morning. The big sis usually gets up before me on Saturday as she prints her worksheets for Sabbath School. When I went to the kitchen she told me there's nothing to cook for breakfast.All that was left in the fridge were 2 eggs, soy milk and the spare blueberry filling from the blueberry cheesecake I made a week early.. This past week had been toxic at work. Big S took her class on a field trip. We were too exhausted by Friday that we didn't bother going out for groceries. I told her not to worry as I could bake some thing for breakfast. I checked the cabinet for flour and baking powder. I was relieved to find a pack of flour and just the right amount of baking powder needed to make muffins.. I asked my cousin who was here for the weekend to help. She prepared the wet ingredients. Sister took photos while I mixed. Thanks guys. The recipe is based on chocolate chip muffins at Joy of Baking. Instead of adding choc chips, I used blueberry filling. Preheat the oven to 190 Deg C. Melt the butter. Set aside to cool. Sift the flour, baking powder and salt together. By doing this, you get rid of lumps. Dry ingredients will be evenly mixed. Add sugar to the dry ingredients and whisk. In another bowl, whisk together soy milk, eggs and vanilla extract. 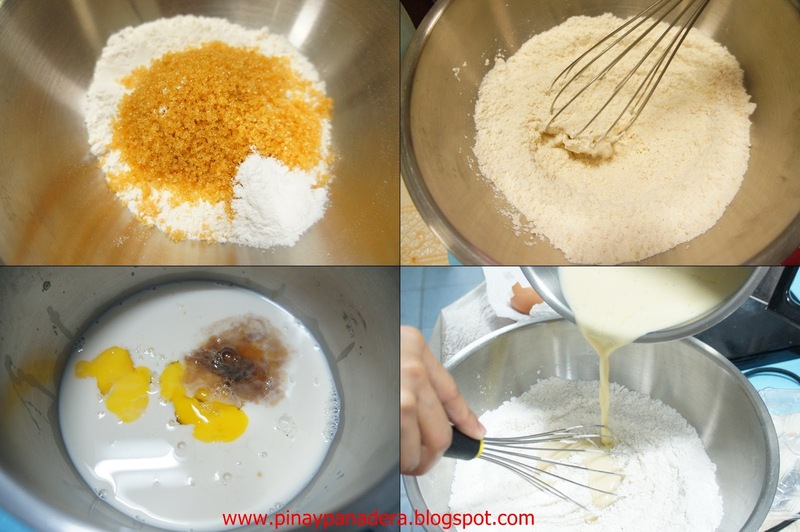 Using a rubber spatula, fold wet ingredients and melted butter into the dry ingredients. Stir until the ingredients are well combined. Be careful not to over mix the batter as this will result to tough muffins. Fill paper liners 1/2 full. You can use a spoon or an ice cream scoop. I pipe batter or use measuring cup to fill the paper liners. 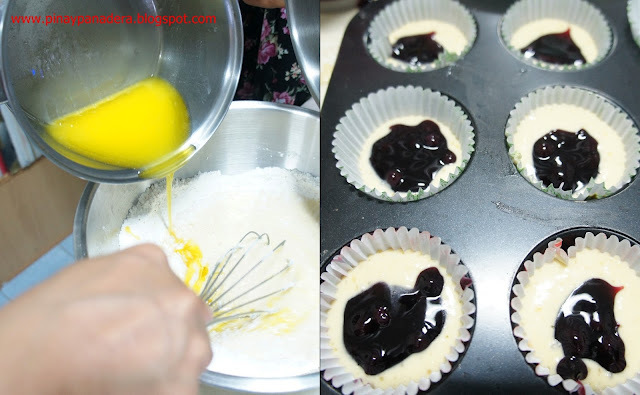 Spoon the blueberry filling into the batter. Cover the filling with more batter until the cup is 2/3 full. Bake until the toothpick inserted in the center comes out clean, about 18-20 minutes. Transfer to a wire rack and let cool before removing from pan.. The filling oozed out when it's done. Who would say no to freshly baked muffins in the morning? I wouldn't.